From the coastal setting and near-perfect climate to its culture and history, America’s Finest City offers an abundance of uniquely SoCal experiences. Here’s our bucket list for the best ways to experience the area, whether you want to play tourist for a day or you need some ideas for entertaining out-of-town guests. 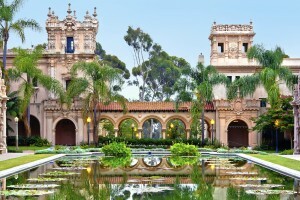 Tour Balboa Park – A 1,200-acre urban cultural park, Balboa Park has been called the “Smithsonian of the West” for the number of cultural institutions it contains, including eight gardens, 15 museums, a Tony Award-winning theater, and the San Diego Zoo. For a comprehensive experience of the park, take a free one-hour ranger-led tour. See Bai Yun, Gao Gao, and Xiao Liwu at the San Diego Zoo – A Southern California landmark, there are countless reasons to visit our world-famous zoo – and one of them is the Giant Pandas! The San Diego Zoo is one of the few in the nation to house these endangered animals from China. Hike through Torrey Pines State Natural Reserve – A track of 1,500 acres of wilderness along the coast, Torrey Pines is a top attraction for a peaceful hike among the rare pines with breathtaking Pacific overlooks. Sunbathe and Surf at Mission Beach – The go-to beach for a lively San Diego atmosphere, Mission Beach is perfect for surfing and soaking up the sun. Tour USS Midway Museum – The country’s longest-serving aircraft carrier of the 20th century, the USS Midway is now parked in the San Diego Bay and functions as an interactive museum, providing a unique experience of a piece of American military history. Eat Fish Tacos in PB – With such close proximity to the coast and Tijuana, fish tacos are a staple meal. We recommend a casual, to-go order and a cruise through the relaxed, surf-friendly neighborhood of Pacific Beach. Try Pacific Beach Fish Shop or Oscar’s Mexican Seafood. Snap a Selfie in front of Cabrillo National Monument – In 1542, the first European stepped out of a boat and onto the West Coast. Visit Juan Rodriguez Cabrillo’s monument at the top of Point Loma, as well as the lighthouse and tide pools. You can also catch an annual reenactment of the conquistador’s landing in October. Shop, Dine, and Stroll through the Gaslamp Quarter – This 150-year-old walkable neighborhood is the historic heart of San Diego and offers the best in dining, shopping, entertainment, and nightlife in a beautiful Victorian architectural setting. Take in the Dusk View at Sunset Cliffs – Popular with residents and visitors alike, the 1.5-mile stretch along Point Loma peninsula’s western shoreline (of the 68-acre regional park) is the perfect spot for a romantic evening stroll. Bring a of couple chairs to park on a rock and really take in the moment. Spend a Day in La Jolla – An upscale community along the coast, there’s plenty to do in this “jewel” of a neighborhood: walk or bicycle through the town; grab coffee and shop; check out the local aquarium and theater; and visit the beach for water activities, including kayaking, surfing, snorkeling. Seaport Village – With more than 50+ diverse shops, 17 eateries, and outdoor entertainment on 90,000 square feet of waterfront property, this items on your bucket list will take more than one visit at Seaport Village. Catch the signature Landlubber’s Day event with free entertainment in September for an extra special experience. Cheer on the Padres at Petco Park – Since 2004, Padres fans have had a beautiful open-air venue to enjoy a ballgame in the heart of downtown San Diego. Make sure to have a local craft brew in hand as you wave your foam finger with the other! Ride the Giant Dipper at Belmont Park – The city’s oldest roller coaster, the Giant Dipper has been thrilling visitors since 1925 at this beachfront amusement park. You get a unique carnival experience with pay-as-you-play rides and activities, plus shopping and dining on the Mission Beach Boardwalk. Visit One or More Local Museums and Sites – Peer into the history, art, architecture, and culture of San Diego at your pick of the city’s museums and historical sites such as San Diego State Historic Park, The Museum of Man, Mission San Diego de Alcala, San Diego Air and Space Museum, the Maritime Museum, The New Children’s Museum, and Spreckels Organ Pavilion (with free concerts on Sundays). Spend a Night at the Hotel del Coronado – The second-largest wooden structure in the U.S., this Coronado Island National Historic Landmark was the largest resort hotel in the world when it was opened in 1888. Beyond luxury sleeping arrangements, The Del offers events, activities, a salon and spa, shopping, golfing, and more. Attend a Festival – Dog surfing, LGBTQ, bacon, oysters, and all kinds of music – there’s a festival for everyone in this city. Del Mar Racetrack – Head to the Del Mar Fairgrounds where the “turf meets the surf” to witness the horses of the Del Mar Thoroughbred Club, in season mid-July to early September. You can be a part of the tradition where Bing Crosby greeted visitors in 1937 and Seabiscuit nosed to victory in 1938. Which items have you checked off your bucket list? Let us know in the comments below! Looking for more fun San Diego things to do? Check out San Diego’s Best Amusement Parks & Water Parks and Best Classes to Take.